Van Lanschot is now officially Van Lanschot Kempen. The existing ticker symbol on Euronext (currently LANS) will change to VLK. Karl Guha, Chariman of the Board, opens the trading day and launches the new name and brand, by sounding the gong. The name, the logo with tree, the foundation year 1737, and the chosen color, together reflect the power of the combination of Van Lanschot and Kempen. Koen Van de Maele, Deputy Chief Investment Officer of Candriam, opens the trading day in Paris for the listing of their ESG and Smart Beta specialised ETFs on Euronext Paris and cross-listing at Euronext Amsterdam. Candriam Investors Group is a leading pan-European multi-specialist asset manager with a 20-year track record and a team of 500 experienced professionals, managing about €107.2 bn AuM at the end of March 2017. 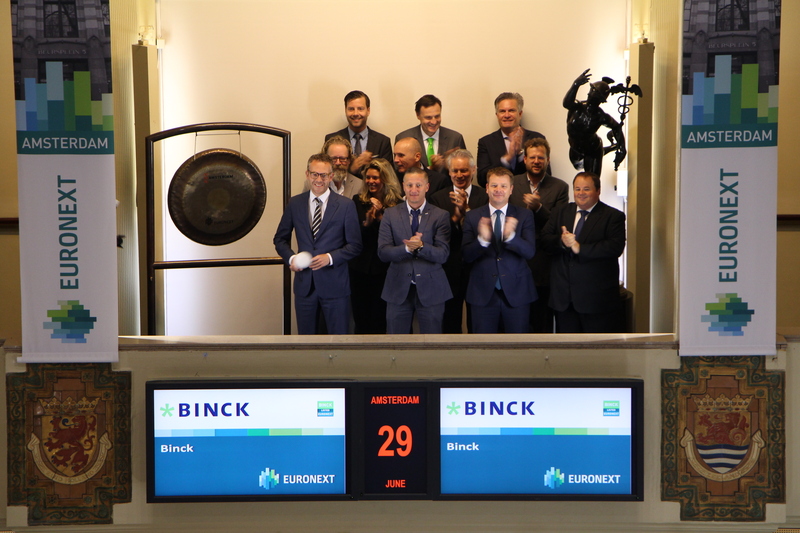 BinckBank opens the trading day to mark the cooperation between Euronext and BinckBank. Binck Netherlands and Euronext Amsterdam will join forces to inform –potential – retail investors about various aspects of investing, including jointly organizing informative and educational initiatives. The aim is to expand knowledge about investing. ‘It’s good to be back’ said Extensa CEO Kris Verhellen just after CFO Laurent Jacquemart rang the bell to open the markets. 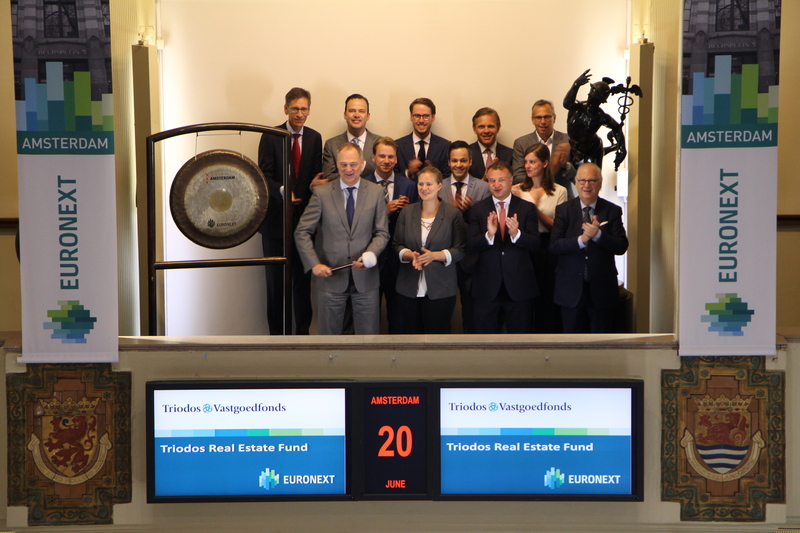 Real estate developer Extensa celebrated the listing on Euronext Brussels of its bonds through the Euro Medium Term Notes (EMTN) programme. 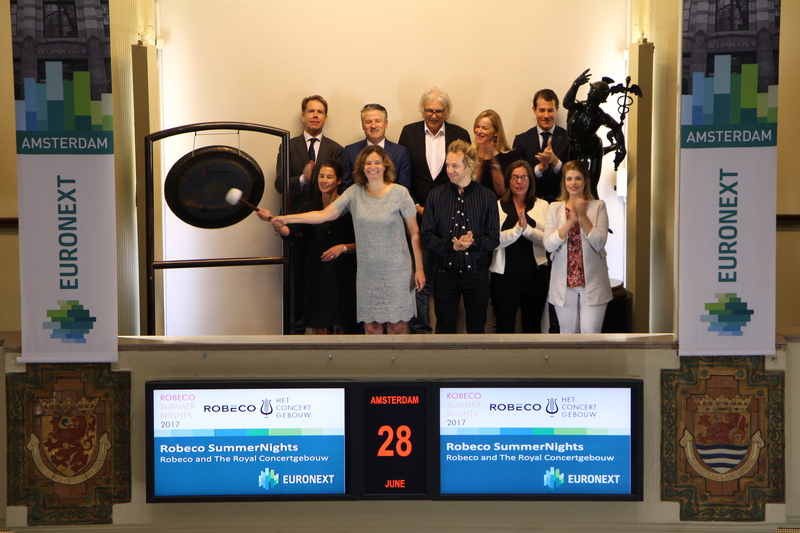 Wilma van Rossum, Brand Manager at Robeco, and Carlien Blok, Head Marketing, Communications and Sales at The Concertgebouw, sound the gong at the Amsterdam exchange of Euronext to open the trading day. Entertainer Sven Ratzke will give a musical introduction to the striking of the gong. The collaboration between Robeco and The Royal Concertgebouw on Robeco SummerNights – the longest-running and most successful partnership in the cultural sector – is about to start once again. Robeco and The Concertgebouw will start the 29th year of their collaboration. This 29th year promises another summer with soloists and orchestras from all over the world. During Robeco SummerNights, which this year will be held between 1 July and 31 August, audiences can enjoy over 80 concerts in The Concertgebouw in the classical, pop, jazz and world music genres. The music will vary from Max Richters 8-hour long SLEEP to three concerts by pianists Arthur and Lucas Jussen, and from the Aurora Orchestra playing Beethoven’s Symphony No. 3 by heart to ‘Viva la Diva’: an evening of glitter and glamour with singers Tania Kross and Sven Ratzke and the Metropole Orchestra. And, as in every edition, there will be international youth orchestras present, amongst which the Gustav Mahler Jugendorchester. 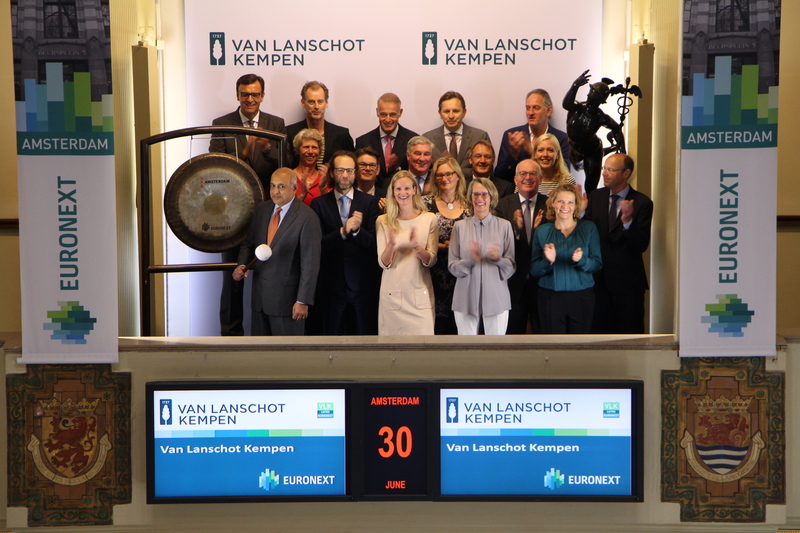 The opening of the Amsterdam exchange of Euronext brings non-financial reporting to the attention. More and more organizations recognize the importance of non-financial reporting and actively work on such (integrated) reports. In addition to the financial results, these reports include the results on sustainability, governance, diversity, privacy and the environment. 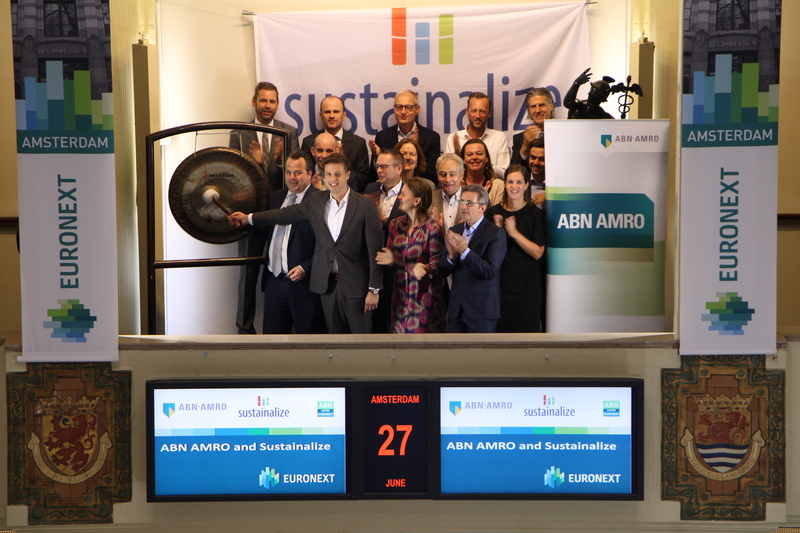 To emphasize the growing interest in non-financial reporting, Tjeerd Krumpelman, ABN AMRO's Head of Business Advisory, Reporting & Stakeholder Management, and Nick de Ruiter, Partner at CSR Consultancy Company Sustainalize, sound the gong and open trading at the Amsterdam exchange. In addition to Sustainalize and ABN AMRO, the gong ceremony is attended by representatives of relevant institutions engaged in reporting non-financial information. Thus, representatives of the Global Reporting Initiative, Eumedion, the NBA and the Association of Investors in Sustainable Development (VBDO) are present. The Ministry of Economic Affairs, responsible for the annual Transparency Benchmark, is also in attendance. 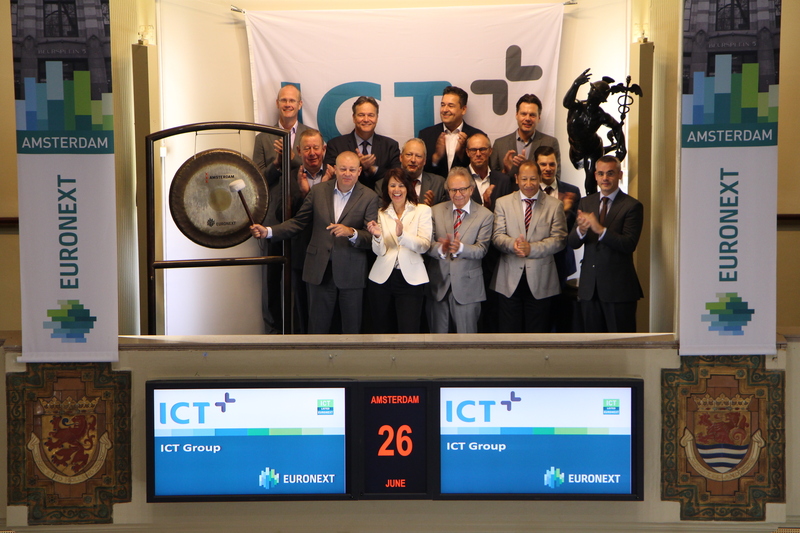 ICT Group (ticker symbol: ICT) opens the trading day at the Amsterdam exchange to celebrate the fact that they have been listed for 20 years and the acquisition of High Tech Solutions (HTS). They hereby surpassed the milestone of 1,000 professionals. ICT Group is a leading industrial technology solutions and services provider. Over 1,000 passionate technical specialists are working for the ICT Group. The main subsidiaries of the ICT Group are: ICT Netherlands, Strypes, Raster, Improve, BMA and ICT Mobile. Piet Buyse, Chairman of the Board of Eandis, rings the bell to celebrate the listing of the company’s retail bond. Sébastien Peltier, CEO of Valbiotis, opens the trading day in Paris. Valbiotis is a biopharmaceutical company specializing in the research and development of preventive and therapeutic products based on polymolecular complexes indicated at specific stages of progression of chronic metabolic pathologies such as type 2 diabetes, obesity, dyslipidemia or NASH (Non-Alcoholic Steatosis Hepatic). The Amsterdam exchange is opened by Jesse van Donk, winner of the ‘AH Product Pitch 2017’, in the company of jury member Marit van Egmond, director Merchandising & Sourcing. Abel’s Deli, of entrepreneur Jesse van Donk, won the competition and gets on year shelf space at Albert Heijn, coaching to achieve growth and an investment package worth €125,000. The jury also appointed two runners-up, ‘Lekker in een Potje’ and ‘Boullion Brothers’, besides shelf space they also receive coaching an an investment package. With this competition, Albert Heijn wants to encourage young entrepreneurs and provide their customers with innovative products. Albert Heijn is part of Euronext listed Ahold Delhaize (ticker symbol: AD). 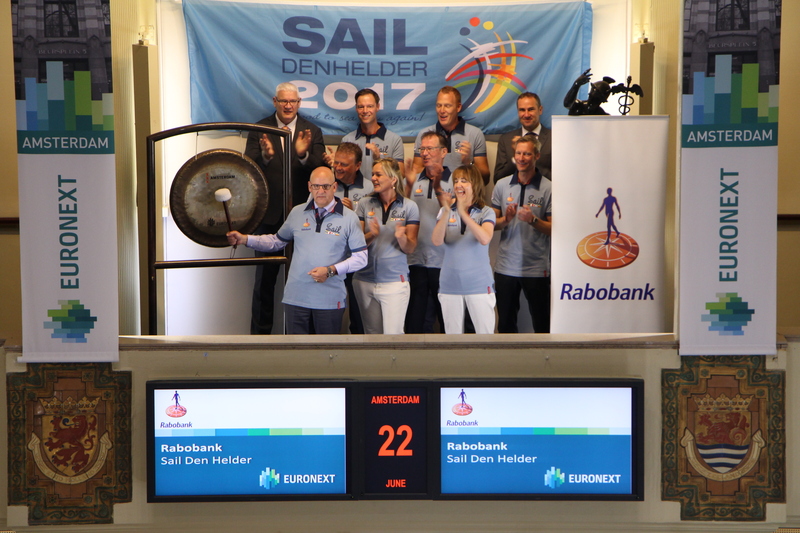 Rabobank, main sponsor of Sail Den Helder, visits the Amsterdam exchange to open trading ahead of the event. Harry Nieuwenhuizen, Executive Chairman Rabobank Kop van Noord-Holland, sounds the gong. Sail Den Helder, held from 22 - 25 June 2017, is the biggest public event in the province of Noord-Holland this year with the backdrop of the international Tall Ships. Visitors take a deep dive in the world of the Dutch maritime nautical heritage: Tall Ships, Dutch historic ships, modern ships and naval vessels as well as the rich history of navigation and ports that is still as important to our economy. Management Scope recently published the Top-100 Corporate Women of the Netherlands in 2017. Petri Hofsté, Corporate Woman of the Netherlands 2017, opens the trading day at the Amsterdam exchange by sounding the gong. Petri Hofsté is Member of the Supervisory Board at Fugro and not only extended her title, but also added a new position as Member of the Supervisory Board at Rabobank . The rest of her career also includes positions in the financial sector, including Supervisory positions at Achmea and KAS BANK. During her career, she has held various positions in the banking sector (as deputy CFO at ABN AMRO), supervisory sector (DNB divisional director), and in the pension sector (as CFO of APG). A female director is eligible for the title if she holds one or more positions as director or supervisory position at companies listed in the AEX, AMX or AScX-index and non-listed companies with an equity of more than 1 billion euros. Since 2016, the ranking has been extended from a Top-50 to a Top-100. Management Scope is a magazine for the top of business Netherlands. The editorial mix consists of interviews with CEOs and directors, analyzes and expert contributions about strategic business issues, leadership, governance and relevant social and technological developments. Triodos Vastgoedfonds, the first European sustainable real estate fund, launches a fixed price offering of up to 11,463,182 newly issued ordinary shares. 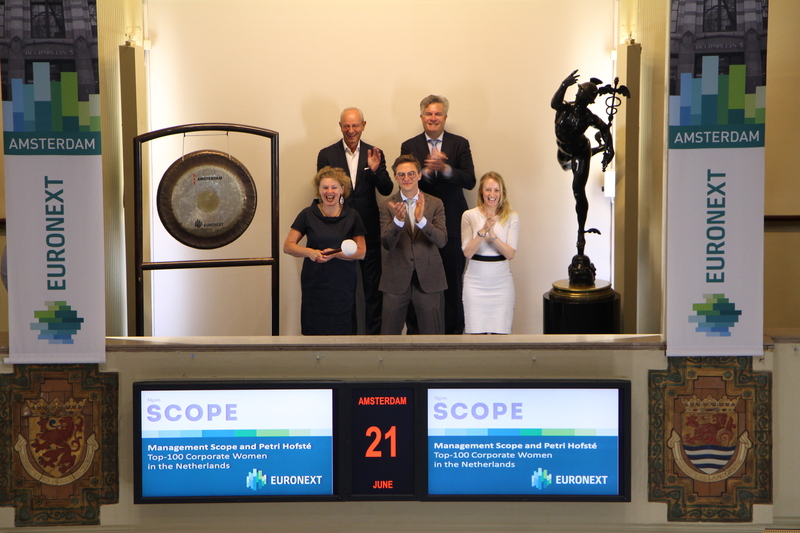 The new shares issued as a result of the private placement are listed on Euronext Amsterdam. Guus Berkhout, Fund Manager Triodos Vastgoedfonds, opens the trading day by sounding the gong. Triodos Real Estate Fund was founded in 2004 and is the first sustainable real estate fund in Europe. The fund invests exclusively in sustainable build managed buildings and monuments. Triodos Investment Management links investors who want to put their money into permanent, positive change, with innovative entrepreneurs and sustainable companies that are working on just that. In this way they serve as a catalyst in those sectors that play a key role in the transition to a fairer, more sustainable world. 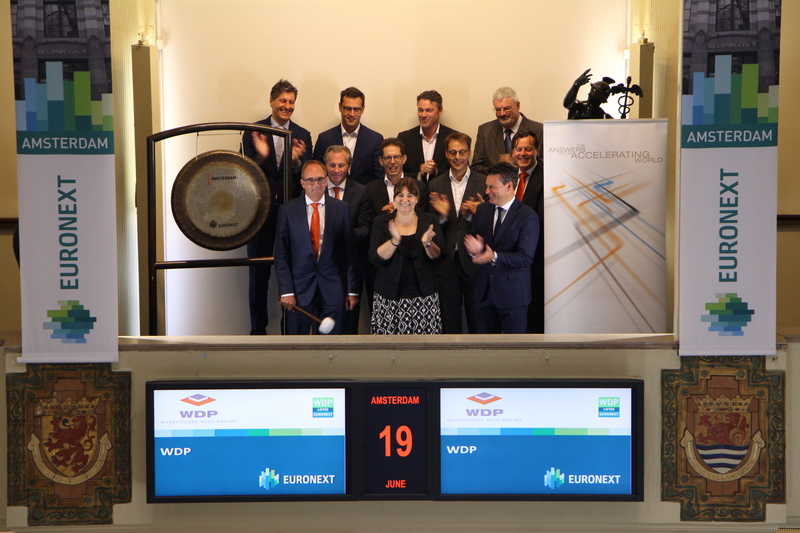 Real estate specialist WDP (ticker symbol: WDP) opens trading at the Amsterdam exchange, celebrating its long term partnership with DHL. By building a new sort center for DHL Parcel in Amsterdam, WDP is now developing the tenth site within its property portfolio for DHL in the Benelux. The new site is being built by construction company Aan de Stegge Twello. The warehouse will also be equipped with solar panels, in collaboration with Encon. This makes it the sixtieth WDP solar roof. WDP develops and invests in logistics property (warehouses and offices). WDP's property portfolio amounts to more than 3 million m². This international portfolio of semi-industrial and logistics buildings is spread over more than 160 sites at prime logistics locations for storage and distribution in Belgium, France, the Netherlands, Luxembourg and Romania. ## sale of used vehicles. At the end of 2016, the group had a fleet of 1,375,000 vehicles. This week IEX presents the ‘Week of Technical Analysis’. Together with the five most well-known Dutch TA-specialists IEX.nl, the largest investor community in the Benelux, pays extra attention to this popular form of market analysis. 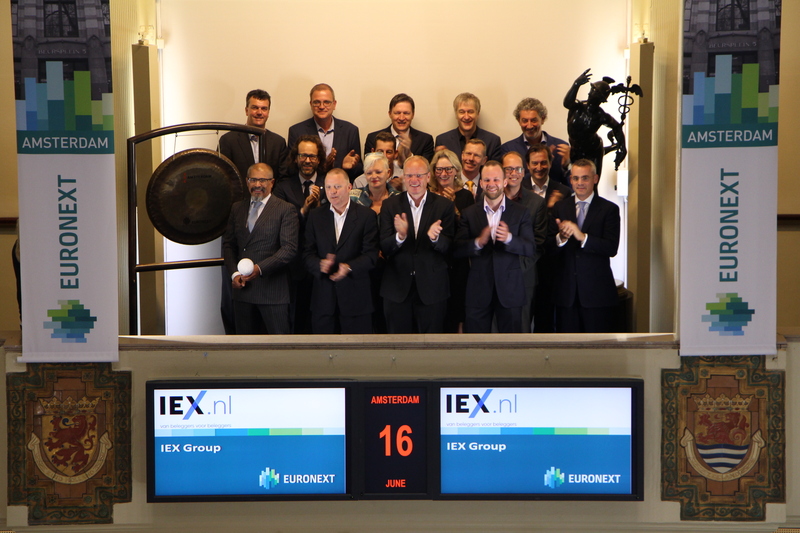 IEX Group (ticker symbol: IEX) reaches an audience of 1.5 million investors, of whom 1.25 million in the Netherlands and about 250,000 in Belgium. IEX Group has strong brands in the Dutch market, including IEX, Belegger, DeBeurs, Eurobench, Participations and IEXGeld. On the Belgian market, IEX Group is active with Beursduivel. IEXProfs focuses on the professional segment. Trading day at the Amsterdam exchange is opened by Swannet Limpens and Yanna Resia from ABN AMRO. The gong also marks the start of the National Prokkel intern day; part of a week in which thousands of people with a (mental) disability intern for one day. The goal of Prokkelstages is to learn what work opportunities there are for people with disabilities and to take further steps towards an inclusive labor market. ABN AMRO has an active employment policy. Swannet Limpens is head of office in Heerlen and has accepted Yanna, who has a slight intellectual disability, as hostess to welcome guests and to accompany them to their appointment at the bank. The Dutch Prokkelweek is a week for integration and participation of mentally handicapped people. One day to get to know each other’s capabilities, one day as an example and inspiration for the rest the year, one day with the aim of creating an inclusive labor market. 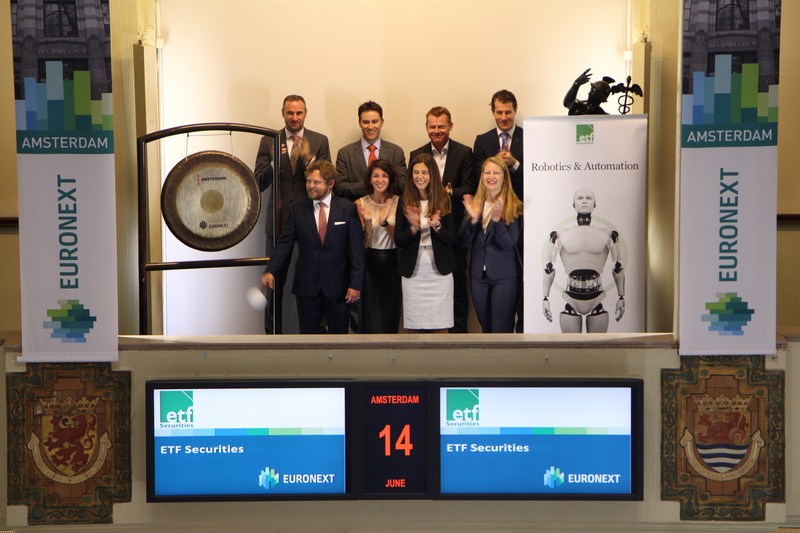 ETF Securities, one of the world’s leading, independent providers of Exchange Traded Products (ETPs), listed three of their ETPs on Euronext Amsterdam and Euronext Paris. Dutch investors can now access the firm’s robotics & automation, cyber security and physically vaulted gold ETPs on their local exchange. On this occasion, ETF Securities opens trading by sounding the gong. 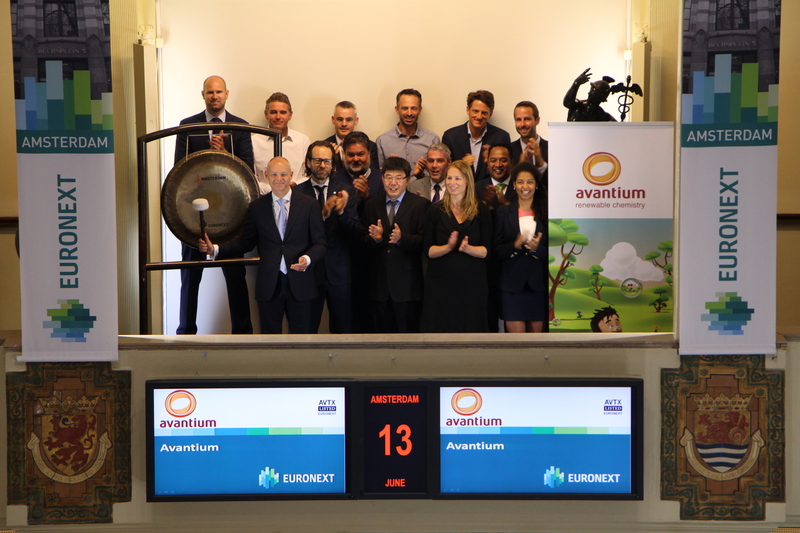 Avantium (symbol: AVTX) sounds the gong to celebrate that its shares will be included in the AScX index of Euronext as of the start of trading on Monday 19 June 2017. The inclusion of Avantium was recently announced by Euronext following its quarterly review of the AEX, AMX and AScX which is based on free-float adjusted market capitalization and liquidity. The AScX index is composed of 25 funds that trade on the Euronext Amsterdam exchange and rank position 51-75 in size. The inclusion follows the listing of Avantium shares on 15 March 2017. Frank Roerink, CFO Avantium, sounds the gong accompanied by a group of employees who have been working at Avantium almost since the very beginning. Avantium is a leading chemical technology company and a forerunner in renewable chemistry. Together with its partners around the world, Avantium develops efficient processes and sustainable products made from biobased materials. Avantium offers a breeding ground for revolutionary renewable chemistry solutions. From invention to commercially viable production processes. Avantium also provides advanced catalysis research services and systems to the leading chemical and petrochemical companies. Avantium recorded revenues of € 10.5 million in 2016. 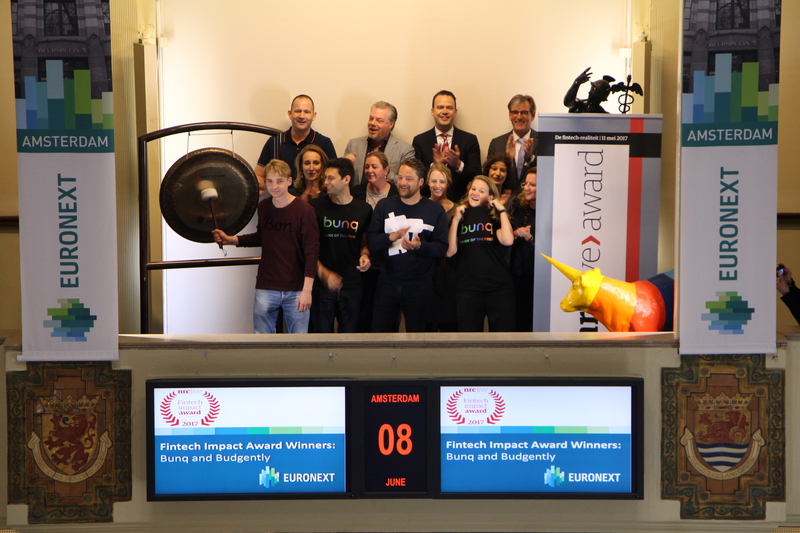 Avantium shares are listed on Euronext Amsterdam and Euronext Brussels. Listing of Antalis on Euronext. Hervé Poncin, CEO of Antalis, opens the trading day in Paris. Antalis International is Europe’s leading company specializing in professional distribution of paper, packaging products and visual communication products. The group offers coated papers, printing and office papers, envelopes and pouches, labels, packaging and storage products, plates, marking films, posters, etc. 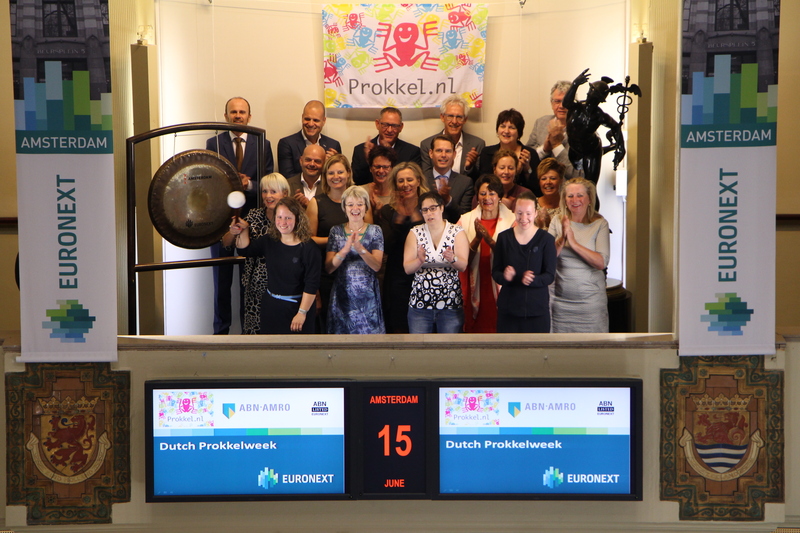 The trading day at Euronext is opened by Stofwisselkracht Foundation, Team Axel and Team Euronext to call attention to the Stofwisseltour 2017. Stofwisselkracht Foundation funds research for metabolic diseases through sporting events and various activities. Stofwisselkracht Foundation, organizer of the Stofwisseltour, hopes for a successful tour. The gong is sounded by Robin van Galen, Coach of the Dutch Men’s Water polo, who is an ambassador of Stofwisselkracht Foundation. The Dutch water polo men also ride in the Stofwisseltour. Team Axel visited the Amsterdam exchange for the first time in 2015. 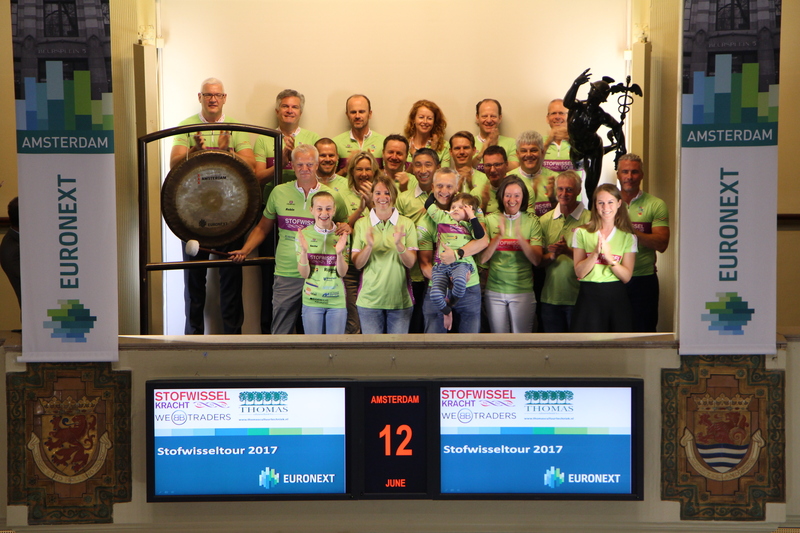 Since then, a team of Euronext-employees participates in the Stofwisseltour as ‘Euronext for Team Axel’. This year’s Stofwisseltour takes place from 16 –18 June. Over 230 cyclists participate in this three day cycling relay to raise money for research into metabolism diseases and to raise awareness to this relatively unknown disease. The finish of the tour is live broadcasted on NPO 1 on Sunday 18 June at 6 p.m.
Fabien Bardinet, CEO of Balyo, opens the trading day in Paris. Balyo specializes in the design, manufacturing and marketing of robotic handling trolleys for all logistics applications. The group offers stackers, tractors, pallet trucks, etc. capable of perceiving their environment with ease, interacting with the surrounding elements and completing tasks autonomously. 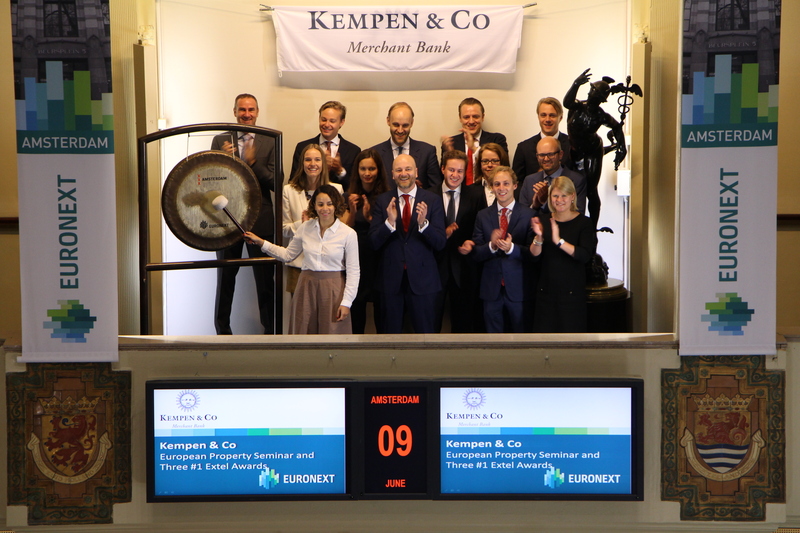 Kempen & Co opens trading at the Amsterdam exchange for the celebration of the 15th anniversary of the annual Kempen European Property Seminar. The seminar brings together European real estate companies and investors and has become a central meeting point for the European real estate sector. During one-on-one meetings and small group meetings, more than 50 CEO’s and CFO’s from a wide range of companies are connected. It just so happens the seminar won this week the 2017 #1 ‘Top broker conference’ Extel Award. Kempen & Co was also selected as the #1 best brokerage firm in real estate on both a team and an individual basis. As one of the few focused merchant banks in Europe, Kempen & Co is uniquely positioned as a specialist in the real estate markets. Over the past years, Kempen & Co have built a strong position in this sector in securities brokerage, mergers and acquisitions, and equity capital market transactions. Open financial platform Bunq and personal finance developer Budently wererecently named winner of the Fintech Impact Award 2017. Not only did bunq receive the most votes from both general public and audience, together with Budently they were also named winner by the members of the jury Don Ginsel, Janneke Willemse, Willem Vermeend and Oscar Kneppers. Budgently and Bunq open trading in Amsterdam together with NRC and the partners of the award; knab, Topicus en Capgemini.